Our Black and White Dance Floor is a popular choice by many brides and grooms as the colour style can easily compliment your venue decoration and with your eyes set on perfection – why settle for anything less. We have several photos of the black and white dance floor and these can be found in the gallery. Typical sizes for dance floors are 16 x 16ft and can accomodate 60/65 guests. (Total guest number 120-140) We use 50% of your total evening guest numbers to work out the correct size floor required. Floors are primarily laid in squares and rectangular shapes can also be built. Email the team for a quote. Not a Black and White Dance Floor fan? 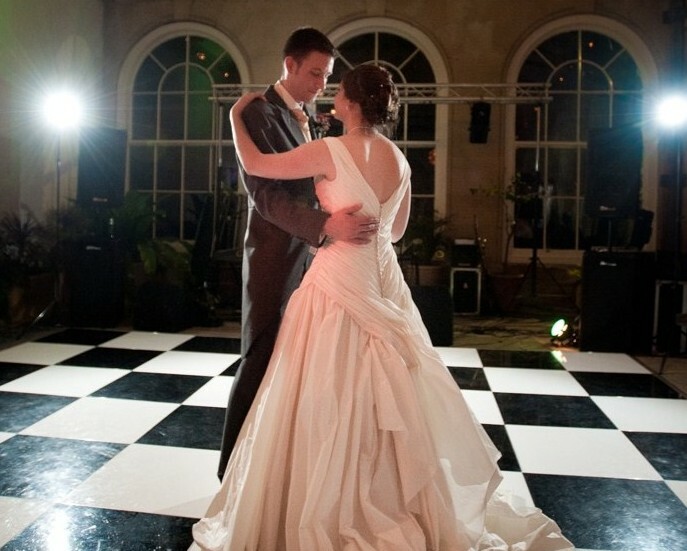 Black and White Dance Floor hire is available throughout the UK including Derby, Burton on Trent, Stoke on Trent, Nottingham, Leicester, Manchester, Liverpool, Chetser, Preston, Blackpool, Carlisle, Newcastle upon Tyne, Durham, Middlesborough, Leeds, Bradford, Wakefield, Glasgow, Edinburgh, Scotland, Inverness, Kettering, Northanmpton, Milton Keynes, Coventry, Rugby, Luton, Hemel Hempstead, Welwyn, Hammersmith, Totenham, Wembley, Kent, Essex, Brighton, Portsmouth, Bournemouth, Swansea.